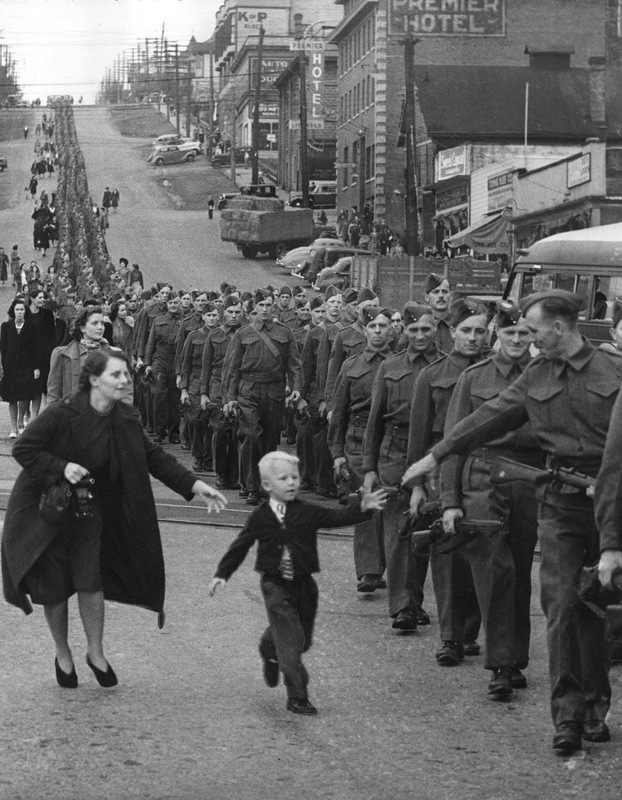 The photo ‘Wait for me, Daddy’ shows Private Jack Bernard, B.C. Regiment saying goodbye to his son Warren Bernard in New Westminster, 1940. “Wait for Me, Daddy” is an iconic photo taken by Claude P. Dettloff on October 1, 1940, of The British Columbia Regiment (Duke of Connaught’s Own Rifles) marching down Eighth Street at the Columbia Street intersection, New Westminster, Canada. Pictured are five-year-old Warren “Whitey” Bernard and his parents Bernice and Jack Bernard, as the family was about to be separated by the war. The picture received extensive exposure and was used in war-bond drives. Five year-old Warren “Whitey” Bernard was in Grade 1 at nearby General Wolfe Elementary. Whitey’s Dad was enlisted in the British Columbia Regiment and was stationed in the city on various sentry points throughout the city. Since the declaration of war in 1939 the men of the BC regiment had been doing various guard duty assignments which were boring and monotonous. Finally after months of waiting the regiment received word that it was to be moving to a secret destination “Overseas”. As the troops marched to a waiting train to take them to their next destination, photographer Claude P. Dettloff of The Province newspaper positioned himself to photograph the whole column marching down the hill. As he was getting ready to take the picture, he saw a young boy run out onto the road. The mother’s outstretched hand and the swirl of her coat, the boy’s shock of white hair and his own reaching hand, the father’s turning smile and the downward thrust of his own outreaching hand — he has shifted his rifle to his other hand to hold his son’s for a moment — the long line of marching men in the background, all this makes an unforgettable image, a masterpiece of unplanned composition, a heart-grabbing moment frozen for all time. The picture Dettloff captured was picked up all over the world, getting exposure in Life; it hung in every school in British Columbia during the war. The secret destination the regiment was heading to turned out to be Nanaimo, only three hours away. The regiment spent time on the coast defending against German and then Japanese attack. It wasn’t until August, 1942 that the bulk of the Regiment sailed for England. They didn’t see action until July 23 1944 when they landed at the established D-Day beach head and participated in Operation Totalize, one of the first attempts to close the Falaise Gap. After the Allies had crushed the German Army groups based in France they with the rest of Allies harassed the retreating Germans all the way to Holland. There the regiment took part in a number of operations in Holland and in Northern Germany. The last battle they took part in was on April 17, 1945 when they crossed the Kusten Canal. A month later Victory in Europe day (VE-Day) was declared on May 5, 1945. Through out the war the Regiment had 122 Officers and men killed and 213 wounded. Father and son after the war was over. Whitey’s dad survived the European theatre and came home in October 1945. One casualty of the war was Whitey’s parents marriage; as Jack and Bernice Bernard eventually divorced. Whitey grew up and moved to Tofino and met and married his wife Ruby in 1964. His wife Ruby, fondly recalls that she had actually known her husband for years. Whitey’s photo “was hung in every school in British Columbia. during the war”, she said. “I saw him years and years before we actually met”. He ran a small marina that sold hardware and gas before getting involved in local politics. He was elected an alderman then was major for several years before becoming a Councillor. He’s now retired but his son, Steven Bernard, still runs the family marina. The City of New Westminster commissioned a bronze statue honoring the photo to be placed at the bottom of 8th Street, in Hyack Square. The city unveiled the statue on October 4, 2014. At the same event, the Royal Canadian Mint announced the issue of a series of three coins featuring a scene adapted from the image: it was released in denominations of $2 (alloy), $3 (1/4 ounce silver) and 10 (1/2 ounce silver). Canada Post also issued a stamp featuring the iconic image. (Photo credit: Claude P. Dettloff / The National Archives of Canada). A good photographers work (like Claude P. Dettloff) speaks volumes to the public, more so then any article that was written with it. Give me just one of these precious, honest photographs showing true emotions in these moments in time. 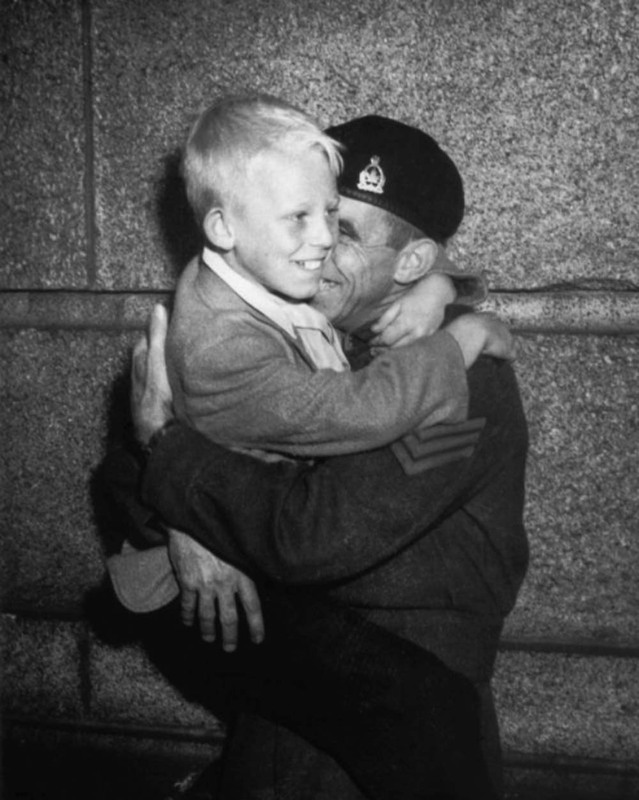 I was happy to see the follow-up photograph showing the son welcoming his father home. This boy was one of the luckier children from that war. It makes me sad that over the years there have been many, many sons (and daughters) having their picture taken saying "Wait for me Daddy."